Killing an innocent human being is a crime. That’s obvious. But did you know that sometimes it’s illegal not to kill a human being? That’s the insanity of current cloning laws. Cloning is simply a form of reproduction. There are two kinds of cloning: reproductive and therapeutic. Reproductive cloning occurs when you create a human embryo that is genetic duplicate of another person. That newly created human embryo (the clone) would then be placed in a uterus to initiate a pregnancy and allow the human to grow to term. However, reproductive cloning is currently banned in California and about a dozen other states. It’s also considered unethical by many organizations. Therapeutic cloning involves the exact same process as reproductive cloning to create a human clone. The difference in therapeutic cloning is that you kill the newly formed human embryo within a few weeks so you can harvest its stem cells. That process is legal in the United States. So, think about that. It’s perfectly legal to create a human clone (which is a human being), but you can’t let it grow to term. If you create a human being by cloning, you’re obligated to kill it. Otherwise, you’re in violation of the reproductive cloning ban. So, it’s illegal not to kill that human being. What’s also odd is the rationale for the ban on reproductive cloning. The reason is that the process is exceedingly unsafe. To create Dolly (the first cloned sheep), it took 277 failed attempts before scientists succeeded. Those failed attempts resulted in unhealthy or dead sheep. The same would occur if someone attempted to produce human clones. Hundreds, if not more, humans would be born with deformities, diseases, or die prematurely. That’s one reason why reproductive cloning is banned. 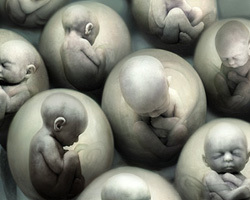 So, reproductive cloning is immoral because of the health risks to the human clones. What’s the solution? Kill them instead. It’s not okay to create human beings that will suffer and die, but it is okay to kill them before they have a chance at life. Don’t get me wrong. I’m not saying that the ban on reproductive cloning is bad. It’s just that the ban combined with the legality of therapeutic cloning leads to an inconsistency in the law. And so this illustrates my biggest concern with cloning. It’s not that I think that cloning is necessarily an immoral process (though I do have problems with it). I’m primarily opposed to cloning because of how a human clone will be treated – it will be considered less valuable than other humans. I think this is a spot-on post. Regarding Dolly, my thought is that we were still figuring all this stuff out. Presently, it is possible to clone pets (though the cloned pet *does* generally end up less healthy than the original). So, yes, cloning Dolly involved quite a bunch of catastrophes and trial-by-error mistakes, but my guess is that the process is *rather* reliable. As far as human cloning goes, I hope concerns are exaggerated. My guess is that we would clone an organ (somehow) or clone a given body part before cloning a given person… Then again, for stem cell harvest, what your are speaking of sounds like not much more than pluripotent adult stem cells. I certainly hope we never go so far as implanting and growing cloned humans… Rather disturbing.